Kuzain bags best football goal award in the US | Daily Express Online, Sabah, Malaysia. Kuala Lumpur: Wan Kuzain Wan Kamal (pic), the American footballer with Malaysian blood, is set to celebrate his 20th birthday memorably after winning the best goal award for the month of August in the United Soccer League (USL), reported the New Straits Times.The announcement was posted on the official USL website and the Sporting Kansas City website, on Monday. The free kick scored by Kuzain on Aug 29, inspired his team, Swope Park Rangers to come from behind to beat Tulsa Roughnecks FC 2-1 at Children's Mercy Park. The swerving free kick, received 30 per cent of the overall votes, beating nine nominated goals to the award. Tulsa's goalkeeper, Fabian Cerda was completely beaten by the movement of the ball, having moved to the left first before realising it was too late to react. Kuzain's goal tied the match at 1-1, before teammate Hadji Barry fired in the winning goal. Kuzain, who will turn 20 on Friday, has since scored two goals from 16 appearances this season for Swope Park Rangers. 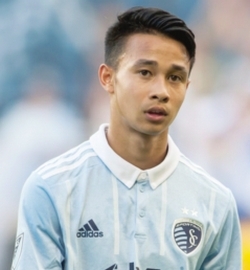 He has also scored one goal and provided one assist in his eight appearances with Major League Soccer (MSL) club, Sporting Kansas City, making him the first player with Malaysian heritage to score in the American top flight league. Last July, Kuzain was named in the MLS squad, that consisted local players only, when they played the Under-20 Mexican side, Tigres UANL.